You're here: Home » So, You Wanna Be a Rock Star (in Content Marketing)? So, You Wanna Be a Rock Star (in Content Marketing)? Content marketing was once an effective means to draw visitors and establish thought leadership until Google Panda (Penguin, Hummingbird, etc) mandated fresh content on a consistent basis. Now, being a content marketing rock star is difficult as content fights for attention in an increasingly crowded internet. Of course, the solution is to get others to share your content (as well as sharing your own content effectively). Content marketing success means harnessing the power of your engaged community, but first you have to get them to see what you’ve written. That’s easier said than done. Recent algorithm changes at Facebook, with others likely following suit, caused organic reach to approach 0, making your job even more challenging. So, you wanna be a content marketing rock star — to take a few liberties with the 1967 Byrd’s song? Whatever your reason for wanting to become a content marketing rock star, content marketing success is a lot harder than it was even 5 years ago, but still the easiest and least expensive means to achieve your goals. So, let’s look at ways to become a content marketing rock star — and check out this very cool infographic from Canva and RazorSocial for more insights on becoming a content marketing rock star. You can’t become a content marketing rock star unless create great content on a consistent basis. Sounds simple, doesn’t it. But, if you’ve ever stared at a blank screen trying to come up with a great idea for content, you know how hard it is to create content on a consistent basis. Lucky for you, I recently posted an infographic containing the perfect post for every different social network, including your blog. Writing great content: Knowing what the perfect post looks like is only half the battle, you still need to know what to write about. That’s where tools like BuzzSumo, Google Trends, and Feedly come in handy. Feedly (which is also great for content curation) brings recent content created by others to your inbox so you can see what others are talking about. BuzzSumo and Google Trends identify which topics are trending and, in the case of BuzzSumo, show how successful these posts are in getting shared. Use these tools to identify trending topics and even help identify headlines that work well. A killer headline: Headlines are the most important part of your content marketing success, so spend some time crafting a really good one. Portent is great tool for crafting the perfect headline (notice in the infographic the importance of a great headline in getting your content shared). Other tips? Include a number (doubles your shares), strong words (like killer), and don’t be afraid to go negative or create some controversy. Add a compelling image: Posts with images get shared much more than posts without an image. Luckily, a number of tools exist to help create or find compelling images for your posts, including Canva. Optimize your images for various social networks and include Twitter cards (a way of sharing images) to increase sharing. And, don’t forget to optimize images for Pinterest. Organization means consistency: Using a content marketing calendar will help you become a content marketing rock star. Create your own using Excel or use this template. Get help: Use your community to help create content. A contest is a great way to generate user-generated content, for example. Or invite guest bloggers to contribute high-quality content. (If you’re interested, I do accept guest posts. Please read my guidelines here). While many tools in the SEO arsenal don’t work (or actually work against your efforts to become a content marketing rock star), don’t ignore traditional SEO. Keywords: Keywords now become keyword phrases. You should emphasize keyword (phrases) searchers use to find your content, but don’t overdo it (keyword stuffing). On average, I like to use my main keyword once for every 100 words on the post, although there’s no definitive optimal number of keywords. Now, I realize few folks will query “content marketing rock star”, but I chose this keyword since it almost begs viewers to click. I mean who doesn’t want to be a content marketing rock star. To appease the Google robots, I’ll beef up my focus keyword with several others likely to address searchers’ needs. A good SEO plugin (if you’re using a CMS like WordPress) goes a long way toward helping you manage your keywords. I use WordPress SEO by Yoast — the best in my opinion. Google has a great, free tool to help with keyword planning. It’s part of Google AdWords, but you can use it to estimate the number of searches and competition surrounding your keywords and even help identify related keywords. Social media sharing is the holy grail for content marketing success. The more your content is shared, the most folk will click over to your website and the higher your sales. Being a content marketing rock star means rocking social media. Adding share buttons on your content is the best way to encourage readers to share. I use AddThis, but other social sharing tools work great. Using a sharing tool that displays the number of shares increases sharing by acting as social proof. Building an engaged community and sharing your content with that community creates content marketing success. I share each piece of content several times using the recommendations from Buffer in this infographic. 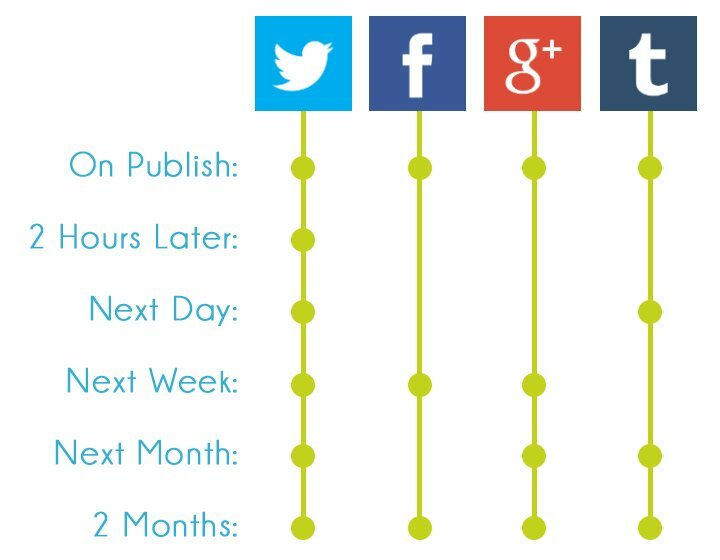 I like this schedule because it’s based on experiments at Buffer to identify the optimal sharing schedule. I add LinkedIn to this list, following the pattern for sharing on Facebook. Another tool I use to share my old content is Outbrain, which places related content at the bottom of each post to encourage readers to visit another page, and AddThis, which recommends popular content when readers get about 2/3 of the way through a post. Don’t forget to share your content with your email list. Some bloggers share every time they post, I prefer to save up a few posts, then send them all out together so subscribers don’t find their inbox overflowing with messages from me. The infographic lists other tools that make social sharing easy and effective. As with anything else, analytics matter. I check metrics from my blog and my social networks every day using tools like Google Analytics, Sprout Social, and Buffer, as well as analytics from the social networks. Along with other measures, look for what’s working in your content marketing strategy and what’s not by monitoring which pages get the most views and which pages get the most shares. Then look for what popular posts have in common so you can create more content that matches these popular posts.